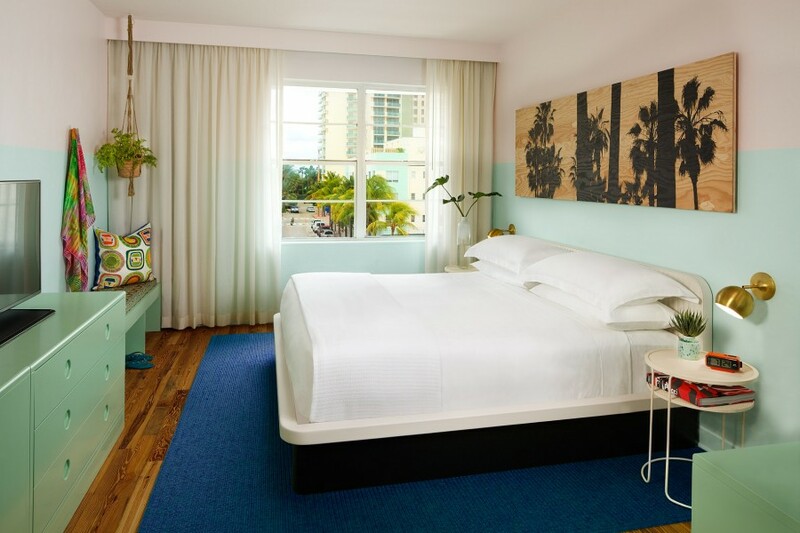 Opening this summer in South Beach, Florida is a new luxury hotel – The Hall. This 164-room boutique hotel in South Beach is set on an incredible 1.4-acre property and will be the first East Coast hotel from Joie de Vivre – the boutique lifestyle hotel brand. The Hall hotel will feature a stunning Olympic-sized pool that will be surrounded by chic cabanas that will enable a great social scene. An amazing colossal banyan tree anchors the outdoor space and you can also enjoy a backyard bar and outdoor lounge. Guests at The Hall boutique hotel will enjoy delicious F&B (Food and Beverage) choices from star chef and restaurateur Spike Mendelsohn (Good Stuff Eatery; We, The Pizza; Béarnaise), and the design from talented Robert McKinley (The Surf Lodge, Ruschmeyer’s). Spike Mendelsohn is a classically-trained chef and opens his first restaurant in Miami. Named “Sunny’s”, the new a casual courtyard eatery was inspired by classic seaside cafes plus beach bars from all around the globe. The main entrance to The Hall hotel is on 15th Street and Collins in Miami’s South Beach. It’s centrally located and near the beach and Atlantic Ocean, in addition to Miami Beach Convention Center. The three building hotel is uniquely Bohemian in design. Each of the three-story buildings are connected together utilizing colorful pathways that provide a beachside village look and feel. Utilizing the creative design concepts from Robert McKinley, all rooms at The Hall hotel will feature custom and reclaimed furnishings. Some examples are – lacquer case goods in pastel green, wire mesh night tables, artwork of palm trees, salmon-colored louvered doors, in addition to photos of surfers and beach waves by famed photographer Scott Rudin. Foodies can rejoice. The hotel’s breakfast, all-day and dinner menus will feature reinterpretations of classic food favorites from Spike Mendelsohn. He’s created his dining offering sform his many travels. A sample dish will be Gulf Coast Grilled Grouper “Reuben” that’s made with Swiss cheese, sauerkraut, plus Thousand Island and Cajun seasoning on marble rye. Delish! In the spacious outdoor space we mentioned earlier, how about trying a game of bocce ball? The beautiful banyan tree will be adorned with tree-hung string lights to set the mood at night. It’s the ideal place for hotel guests to hang out and relax in a tropical setting. If you are interested in staying at the new The Hall boutique hotel in South Beach, Florida, please contact The Life of Luxury. We can help you plan all of your luxury travel needs for the ultimate, Miami VIP experience. Come back again to read our luxury blog and learn all about the latest travel industry news and package deals.